Markets ebbed lower across the board yesterday, with crude prices taking the lead lower. While the EIA’s inventory numbers were significantly less bearish than the API’s forecast, they were still weaker than the market expectations. The real market driver, though, was the financial market, which is still plagued with uncertainty following Trump’s announcement of tariffs. The financial concerns led crude prices to fall $1.45 (-2.3%) yesterday. Today, crude markets are trading flat at $61.19, waiting for more significant market-driving news to send the markets higher or lower. Refined fuel prices also fell yesterday, though declines were less acute – diesel prices fell 1.5%, and gasoline prices fell just 1.2%. Today, prices are mixed. Diesel prices are flattish, trading nearly unchanged from yesterday’s close at $1.8738. Gasoline prices are seeing some losses today, with prices down 1.3 cents (-0.7%), trading at $1.8974. The major fundamentals update yesterday came from the EIA. The EIA’s inventory report certainly contributed to the damper on oil prices – markets rose $.75 immediately following the report at 10:30 AM, followed by a loss of $1.50 over the next two hours. The report showed that refinery maintenance season is hitting its stride, with refinery utilization generally flat week-over-week at 88%. However, financial markets also fell yesterday around the same time period, and stock prices don’t care all that much about crude inventories. So what’s the other driver? Yesterday’s selling could be considered a “risk-off” event – traders are getting nervous about key trends including interest rates and trade rates, so they’re exiting the market. 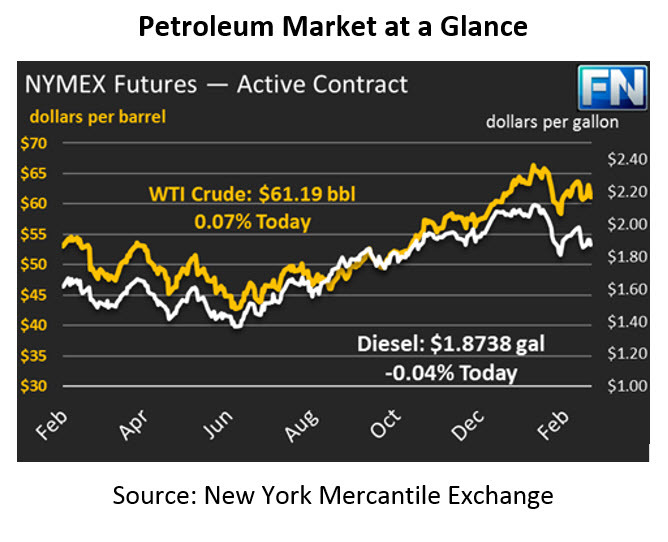 Because markets are at record high net lengths (total contracts bought and held minus contracts shorted), there are few new market participants able to absorb the sales of oil contracts, so prices fall. Although the oil market fundamentals still look neutral/bullish (demand is robust, and OPEC cuts continue to have an effect on the market), the technical financial factors are not in favor of higher prices in the short-term.